Without that one I would have never come this far. When you let me take that guitar to school." -- Ernie Smith, from "Mr. Music"
The city lights of Kingston glimmer in a panorama from the edge of the Blue Mountains in the East down to Hunt's Bay and resume in the distance at Portmore. The dark void of Kingston Harbor is delineated by the lights on the Palisadoes in the Southern distance, ending eerily at Port Royal. This is the vista from singer Ernie Smith's balcony in Red Hills. It was from this perch one evening in February 1996 that I was indulged for nearly two and a half hours in one of the most interesting career retrospectives I have ever heard. While Glenroy Anthony Smith is similar in many respects to the wealth of talent that has come and gone through the walls of countless Kingston recording studios, he is a distinctly unique and enduring entity in Jamaican music. His songs, with the trademark deep baritone vocals, still play frequently on Jamaican radio. His name still draws smiles of recognition and familiarity when mentioned to any Jamaican. "I was born in Kingston. I grew up in a place called Bamboo," remembers Ernie. "We all could sing as kids. My daddy played a guitar. My mother sang in the choir. We'd be driving in the car somewhere, always singing. My father used to borrow a guitar and bring it home sometimes. He bought me my own guitar when I was twelve. "After I left school I tried to find work and went through jobs. About five years after school I realized that no matter what job I was doing, I still was playing something, playing in some band or singing somewhere at night, and I said, 'this must be what I'm supposed to do.' That was the constant. "I was very inhibited, very self-concious, very aware of my shortcomings vocally. After my voice broke, I didn't think I was going to sing again. I was putting the bands together. We (always) had a vocalist. I'd sing a song or two that I had written and that was it. When I started recording, all of that changed." 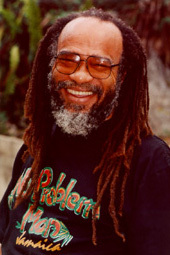 Young Ernie grew up with the typical variety of influences from American and Jamaican radio and the sounds of the Jamaican dance. "I liked whatever I heard on the radio. I liked the local ska that was coming at the time. I didn't have a focus yet. I was singing country music, Beatles hits. "I (recorded) three songs . . . I did "I Can't Take It," "How Bout You," and "Twentieth Century Paces." At the time I had left (home), and I was working with a band, and that's all I was doing. My mother came and said I was wasting my time, (so) I got a job selling life insurance, still playing music at night. I was getting very busy and the owner of the studio came to me one day and said I need to spend some more time. "The long and the short of it is that after those three first songs, they decided to spend some money on promoting, making a hit. The first three (songs) were ballads. But it is interesting, 'Bend Down' was like a country song with a reggae beat, and that was a hit." After "Bend Down," Ernie had a string of number one hits with "Ride On Sammy," "One Dream," and "Pitta Patta." Federal released an album, Greatest Hits with those songs and a selection of covers. Despite his chart and recording success, it took the young Ernie some time to gain confidence in his singing. "Vocally, I went a long time feeling left out because I couldn't hit the high notes. I couldn't sing as high as most people. The first song I sang really low was 'Sunday Morning Coming Down.' It came out really easy." During this period, Ernie wrote songs for Ken Lazarus and John Jones, but none would reach the heights of Johnny Nash's version of "I Can't Take It," retitled "Tears On My Pillow." Ernie recalls, "He made a million. It was a big hit. When I went to Germany in 1975, everywhere I went it was on the radio. "I was getting known for a kind of easy going ballad. I had done 'Bend Down,' 'Ride On Sammy,' 'One Dream' as reggae songs. I kept saying to my producer (Richard Khouri at Federal), 'look, I'm not getting across to the grass roots.' And he kept saying 'look at the sales figures.'" From 1967 to 1975, Federal released five Ernie Smith albums (includingGreatest Hits, Pitta Patta, For The Good Times, and Ernie... Smith That Is). In 1972, he won the prestigious Yamaha songwriting competition in Japan for "Life Is Just For Living," a free-wheeling song originally penned for a Red Stripe commercial. In 1973, the Jamaican government honored him with The Badge Of Honour For Meritorious Service In The Field Of Music. Among Ernie's catalog of work recorded during this highly prolific period are well-known tunes "Duppy Gunman," "Key Card," "Mr. Music," and "Don't Down Me Now." The political turmoil leading to the 1976 elections in Jamaica (most visibly manifested in the assassination attempt on Bob Marley), predicted changes for Ernie Smith as well. "A lot of the people who bought my records moved from Jamaica in 1976 because of the whole change in political climate. A state of emergency was declared. A lot of records were banned. I had written a song called 'The Power And The Glory.' 'As we fight one another for the power and the glory, the kingdom goes to waste.' Now it said, 'as we. . .' I never really pointed at anyone, but the government at the time took it to be an attack. I wasn't really threatened, but I was beginning to feel insecure, because people were telling me, 'the Prime Minister don't like that.'" Amid the tension, Ernie headed for the Northern climate of Toronto, Canada, where he would stay for the next three years. The period marked a transformation for the singer, both musically and spiritually. "Something happened to me in Canada. I experienced something on stage. I did a show at the harbor front. There were four people singing and four people sitting on the floor playing drums. The drums trapped me. I don't know how to put it. I found myself moving on stage like I had never moved. Something broke loose inside of me. I felt out of control, but I felt in control. I was feeling like something cool and clean and pure was flowing through me. That night was an end and a beginning." Ernie recorded two albums in Canada. To Behold Jah was Ernie's first album of all original material, which he laments "was terrible technically, but the music was cookin. Most of the songs on that album were a kind of a spiritual search." The album that followed, Skareggae, included covers of popular reggae tunes from the 60s and the 70s. "While all of this was happening, I was realizing that my family life was a shambles. With that self-search, it seemed like I passed everything through my mind again." In 1981, Ernie moved to Miami to be closer to his wife and children. The new environment didn't bode well for him, and the coming years would be difficult. "When I hit Miami, the realization was hitting me that I really was not in a position to support my children. I didn't have a roof over my head. All of these things was coming home to me under the influence of cocaine. I ended up moving home to Ft. Lauderdale (with my family). And getting bloody irritable." Ernie spent the 1980s dealing not only with a divorce, but also a cocaine and alcohol habit that stifled his creativity and tested his faith and his perseverance like nothing before. Under the advice of a friend, Ernie went to see Cedella Booker (Bob Marley's mother), whom he'd never met but felt he should consult. "I was troubled. I needed some kind of something. I called her up, and I don't remember what I said to her or how I introduced myself. We ended up talking. I went and visited her, and I always came away feeling so strong. I ended up living down there for a while -- just trying to help her do some tracks and write some stuff for her." In 1987, Ernie's creative juices were stimulated by writer/filmmaker Perry Henzell (The Harder They Come), who had Ernie pen the songs for his musical, Marcus Garvey. Though the material was never released on record, Perry Henzell still feels it was of superlative quality and said in a separate conversation that he "would big up Ernie Smith anytime for the work he did on Marcus Garvey." The events surrounding Hurricane Gilbert in 1988 would call Ernie Smith back to Jamaica for good. "After the hurricane I saw certain things that brought me home. I was in a yard and a guy walked in with a branch of a strawberry tree. Everyone was walking around from yard to yard exchanging fruits that had fallen and everyone was grinning from ear to ear and talking about what a big old breeze it was. "I go back to Ft Lauderdale, and I'm watchin the news over there -- the traditional melee interview. You interview the person in front of the rubble of their house, and the person is all over in tears. And them talking to this man . . . him don't have nothing, him lost everything, (but) him have a big old grin on his face talkin about (how) it blow hard and it knock off (his house), but 'me give thanks cause me have life!' And I said 'what am I doing in America? I'm going home.' He brought me home." After returning to Kingston and getting his own severely damaged house back together, Ernie would start writing and recording again and put together a touring band called the New Agenda. The group didn't stay together long and Ernie has since made his way and built a reputation as a 'One Man Band.' "For one reason or another I always end up single," he states with a smile. For Ernie Smith, songwriting bears different burdens now compared to when he was obligated to a record contract. "I still struggle with my own discipline. I still need to just sit down and write. I will hear somebody say something, and I will hear a lyric. Sometimes I hear stuff coming so fast I can't get it down. Sometimes I have to plod and work and slug it out till I get it. "Music to me is a catalyst -- both between me and myself and me and the rest of the world. I can sit and see people and imagine where they coming from and imagine what kind of day they had and reach out to them." Ernie's most recent release is a largely rerecorded compilation of some of his best known hits from the 60s and 70s, done with modern styling and production. The album, Dancehall Ernie Cleans It Up, marks the first time his work has been released on compact disc. His future recording plans are focused on getting together an album of country music ­p; a music he has loved since his youth. "There was always country music programs on the radio. I remember the first little song I wrote in high school -- it was a country feel." At the core of Ernie Smith is a man who exudes a kindness and generosity that is hard to mistake. The markings of success have come with pitfalls and hardships that make a man full and appreciative of true richness in its every form. One of his daily activities is to provide transportation for some local schoolchildren who need safe rides home in the afternoon. He has also sponsored local youths who need money for textbooks. As he drives along one afternoon in Red Hills and passes some kids on the side of the road, they begin to smile and jump and start chanting, "Er NEE! Er NEE!" His celebrity has never separated him from his community and his folk roots. Thanks to Ralph A. Smith for the introduction to Glenroy Anthony (Ernie Smith) and the whole Jamaica experience. Apologies to Horseman for the improper attribution on the photo in Reggae Report.